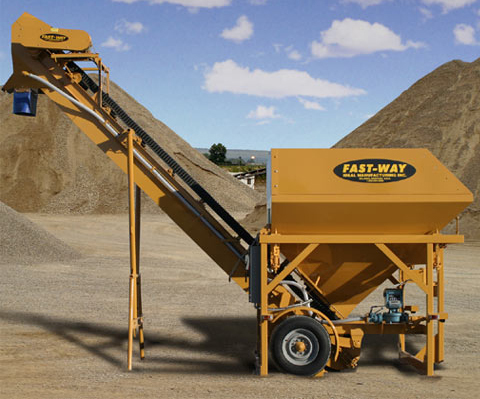 Fast-Way’s all-rubber conveyor belt provides the most efficient and reliable system. The conveyor with rubber side walls and flights will load out an 11-yard batch in 6 1/2 minutes and will produce many years of trouble-free and maintenance-free service. Contact us for more information about our Fast-Way batch plant machinery. Capacity (aggregate and sand): 6 cu. yds. With Extension Kit: 11 cu. yds. Output to 160 GPM, equipped with double trip and auto stop. Hose Bib for wash down, inlet filter and out-put line to conveyor discharge chute. Weight at Hitch: 560 lbs. Shipping Volume: 1,915 cu. ft.